Melbourne, August 2010. One speedlight with homemade grid and CTO, off-camera around 10-o-clock. 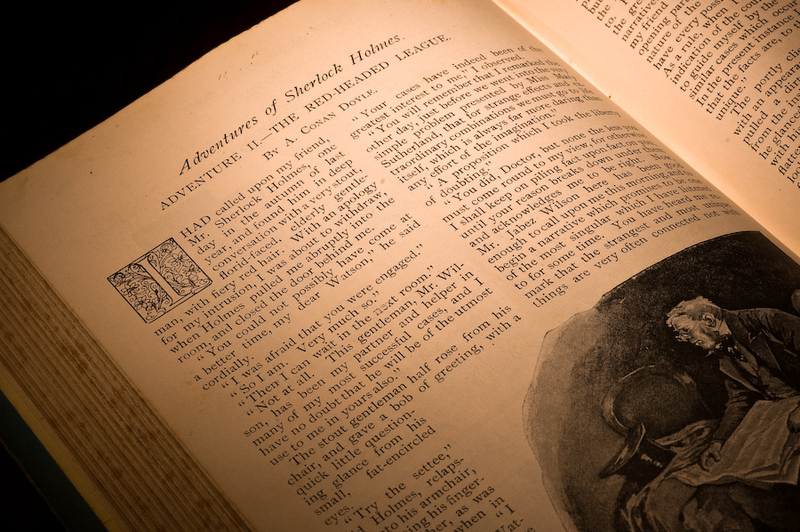 The Adventures of Sherlock Holmes, Adventure II: The Read-Headed League, Strand Magazine Vol II, August 1891. Book geekery: this is an original Strand Magazine hard cover volume, which would have been published at the end of 1891 or early 1892. This edition contains the first six short Sherlock Holmes adventures, including my favourite, shown here. The original magazines were published monthly in a soft cover. The custom at the time was to keep the printing plates for 6 months after the original publication. Twice a year, a hard cover volume containing 6 editions would be printed from the original plates with the ads removed; then those plates would be melted down and recycled. The hard cover volumes were mainly bought by libraries and anyone intending to keep a copy – the soft-cover originals were generally considered disposable, so not many have survived in good condition. Most “original Strand Magazines” you’ll see for sale are therefore the hard-cover volumes, not the true original soft covers (which are quite valuable, especially those containing Sherlock Holmes adventures or other notable stories). The hard cover volumes are nevertheless good value: they’re printed from the same plates, in the same size and on the same kind of paper as the originals. There’s nothing quite the same as reading Sherlock Holmes and seeing the illustrations exactly as they were when they first appeared in print in Victorian London. A good hard-cover Strand Magazine volume costs about as much as a new Kindle. I’ll take the one that doesn’t need batteries. This struck a chord with me as Sherlock Holmes stories are some of those available for free in ebook format these days. Amazing to see the original. Do you own that book? Yes. I have two volumes, one from 1891 and one from 1893, each with six Sherlock Holmes adventures. Mine are only in good condition (which means “not very good” in bookseller parlance :). Still, they’re amongst my favourite books! No need to justify your appreciation for art and history; there really is no comparison to a Kindle. “art and history” – that’s an excellent way to put it. I think I’ll refer to my books as an art collection from now on.